Posted May 6, 2013 by Sage & filed under Coaching, Race Reports, Recovery, Training and Racing. 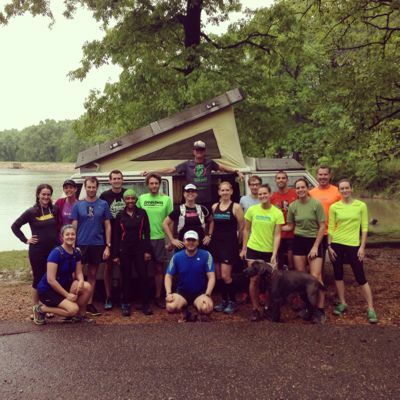 As I alluded to in my Active Yogi post today but didn’t explain clearly on social media, even as I was posting photos last weekend, I traveled to Memphis last weekend for a special event: Francesca’s Unvitational Forty-Miler. (Unvitational, as virtually no one wants to be invited to run 40. And for the acronym FU40.) Francesca, aka Kika, her Italian nickname, is my BFF—our friendship dates back to 1987—and a ferocious trail runner. She joined me at the Mt. 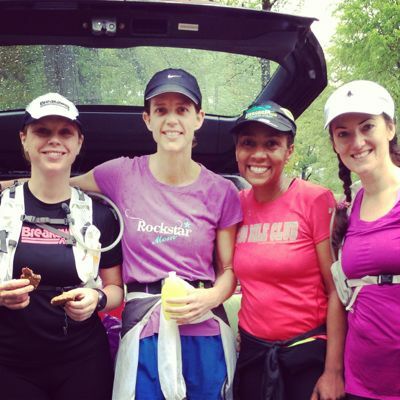 Mitchell Challenge, my forty-for-my-fortieth race, in 2012. 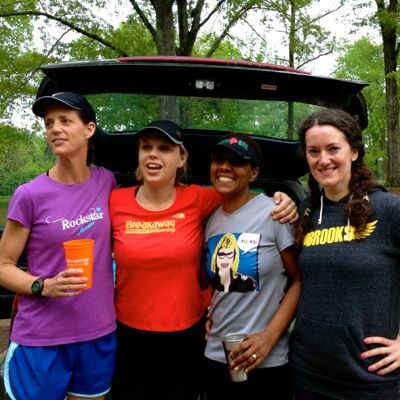 As our birthdays are in August—and August is NOT a time to run 40 miles in Memphis—she planned an April event, laps around the lake at Herb Parsons park east of town. It wasn’t a race proper, either; it was a casual event. Kika suggested charities for her friends to donate to, and ordered some cool stainless-steel pint glasses as swag for folks who showed up to run, bike, or walk some of the course. What a joy to participate in an event outside the usual routines of stressful race travel! There was no packet to pick up (though Kika had thoughtfully prepared race bags for us with gels, chocolate, socks, shirts, and the local running club magazine), no alarm clock to set (Kika turned on Donna Summer when it was time to get up), no hard start or finish time. I didn’t even wear a watch. An even greater joy was focusing on a loved one’s spirits and success instead of my own performance. It was such a treat, I may never race again! It was a surprise to me to feel less sore than I expected to after running 30 miles. (Maybe Twix have magical recovery ingredients when washed down with Coke.) Instead, I enjoyed the sleepy fatigue of having spent an active weekend in a cool city with dear girlfriends and not enough sleep. FU, 40! Cheers, 40! Auguri, Kika! I’m a little disappointed that my 15-year-old Subaru didn’t make it onto your list of luxe transportation, but otherwise this is a wonderful report! So happy & honored that you came to do this wacky event with me.